Yesterday's snow storm brought 20+ inches to the Quiet Corner of CT where we live. My girls were in the same boat as me and throwing up their arms saying "When will this stop." Yes, the snow was nice to look at the first few snow storms, but after the recent storms, which have been every few days, we are all done with snow and ready for spring to get here. Mother Nature is playing tricks with us, with 70 degree weather earlier this month which had the flowers sprouting from the thawing ground, to ice and wind storms and then dumping all this snow on us. Does Mother Nature know that Easter is coming early this year -- April 1st. My youngest daughter said this AM that maybe she was getting her April Fool's jokes out of the way early. Let's hope so. We can't have egg hunts without all this snow on the ground, and will only a couple weeks until the Easter Bunny's arrival, I am wondering if the egg hunts will be moved indoors or cancelled altogether. My girls love egg hunts, so I am already stuffing plastic eggs to hide around the house and hopefully more outside for Easter. And, this year, instead of filling the eggs with just candy, I will be switching things up and adding Welch's® Mixed Fruit Easter Fruit Snacks to the mix. Do your kids love fruit snacks? My girls do, and they are perfect for on-the-go snacking or to add to lunch boxes. The Welch's® Mixed Fruit Easter Fruit Snacks come with fun Easter-shaped fruit snacks - bunnies, flowers, eggs and chicks, that will delight children, as they tear into the Welch's® Easter themed box and pouches that these fat-free fruit snacks come in. You can find the seasonal Welch's® Mixed Fruit Easter Fruit Snacks at your favorite local Target and Walmart stores, as well as online at Target.com and OrientalTrading.com. A 28-count box with 0.5oz/ pouches retails for only $4.99, making this Easter snack a great price and perfect to grab a few boxes and fill your plastic Easter eggs for your family's and community egg hunts with. I will also be throwing a handful of these pouches into their Easter baskets, as I know how much my girls enjoy these fruit snacks, which are made with real fruit and are only 45 calories a pouch. 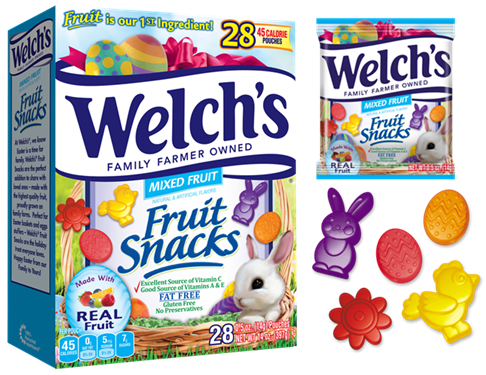 Welch's® Mixed Fruit Easter Fruit Snacks are also a great source of Vitamin A, C and E, are Gluten-Free and have no preservatives, so they are a better alternative to candy this Easter. In addition to the Welch's® Mixed Fruit Easter Fruit Snacks, you will also find also great fruit snack products from Welch's®. My girls are also fans of the Welch's® Fruit Rolls. They recently tried the berry flavor and said it tasted great. At only 70 calories per roll, I am happy to hand one of these fruit rolls to my girls when they start looking for a snack to eat mid-day. I could go on and on about how much my family loves the Welch's® fruit snacks and fruit rolls line, but I am guessing if you have children you probably already stock your pantry with these delicious snacks to fill lunch bags and have on hand when your kids are hungry and start to raid the fridge. You can learn more about the Welch's® Mixed Fruit Easter Fruit Snacks (available for a limited time) as well the other fruit snack and fruit rolls available from Welch's® by visiting http://www.welchsfruitsnacks.com. Having trouble finding Welch's® products at your favorite grocery store or retail store? Then, use this handy store locator to find a retailer near you who carries Welch's® products - http://www.welchsfruitsnacks.com/where-to-find-us/.